The 22nd marked our fourth month here at Kure Atoll and though it has been long since our arrival and still close to three months until our departure, much has happened in the terms of comers and goers in the past few weeks here on Green Island. Unfortunately this wasn’t the year for us to celebrate a successful hatched egged as our two Short-tailed Albatross have finally gotten off their nest with nothing to present. It has been a flux between finding one bird present to none for about a week and by now they should be gone for good. On a few selected occasions both birds were present at their site for what I think was their final goodbyes until they see each other next time when they reunite in October. 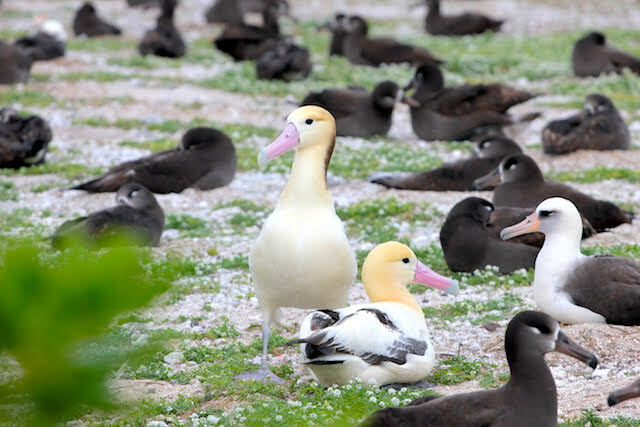 Given the chance to see them stand up, it was a chance to see just how much bigger they actually are over the throng of Laysan and Black-footed Albatross that form the mass of nests around theirs. Last weekend after a late night impromptu decision to watch the sunrise Sunday morning, the group of us gathered on the east-side beach for what at the time we were unaware of how precious a moment it would soon become. It isn’t often we get to leave camp besides for work but we were lucky to have picked the right day as we made way to the Sector 3-4 border. We sat there watching albatross soar under the brightening morning sky with a beautiful array of wispy clouds and transitional rainbow colors. However gorgeous the sky was, nothing could top what happened when I turned around to spot our first albatross chick of the season. There some 40’ away from me was a Black-foot adult standing up and a little bill poking out from within the nest bowl below it. And as if that specific moment was meant to be, the adult stayed standing long enough for me to get everyone’s attention so they had a chance to see. Better yet was that as we walked back to camp we happened to come across a second nest with a newly hatched chick and watched first hand a lengthy feeding of that lovely stomach oil albatross our known for. We’ve also had the arrival of our first Laysan chick as several have hatched in and around camp late this week. Though I smile with the hatching of these new downy albatross bundles, nothing had my blood pumping more than what happened on Tuesday. When I accepted the offer for this position to join this project, I did so knowing I’d finally get to see a beloved bird I hold dear to me, the Gray-backed Tern (GRAT). Granted a few were still here when we arrived, I originally thought it be early spring when I’d see them once again. You could imagine the scene as we worked in Sector 4 East when I heard an ever faint call off in the distance that got my heart racing. My thought was that it could be a GRAT but with all the Tropicbirds squawking I couldn’t entirely be sure. But my heart hadn’t fooled me because minutes later that sound came again and I was way too giddy for my own good; pumping my fists in the air and squealing something slightly distinguishable as “They’re here!” That morning I was describing my mood as in cruise control and now suddenly I felt like I was on full throttle. Hey. Guess what? THEY’RE BACK!!! I apologize for how many times this crew is going to have to hear me say that. And because Kure can’t settle on giving one amazing thing, it wasn’t long until I was pumping my fists again. All day while working along the beach I kept looking out over the reef for something even though I knew seeing one would be extremely rare here. Something still said that maybe it could happen and if I were lucky I’d get to see a whale swim by the island. And of course, as soon as we sat down to do data after finishing the RA I was shouting “whale!” Familiar to seeing whales before, the spray of its breath was an immediate trigger but only Eryn had caught a glimpse of it as it breached and dove down. Fifteen long minutes of waiting and I was given confirmation that it was true and everyone else got to see as it made several passes just off shore in what we believe to be about 300’ deep water. It was likely a Humpback making its way to Japan or Alaska but we don’t know for sure. To say it’s been a good week would be a bit of an understatement I think. Outside all this there has been the arrival of an abundant amount of Portuguese-man-o-wars all along the beaches, several By-the-Wind-Sailors (Vellea), a couple days of high winds, Tropicbirds scoping out nesting places, Black Noddies searching for nest material, and many more sprouts. Besides the Short-tails not much as departed except the vast number of weeds and Verbesina seedlings we’ve craftily dismantled in finishing our second full island treatment rotation. And thus is the current hustle and bustle of life here on Kure. Things seem to be picking up pace as we turn into the long stretch home.